The Cremona M is a speaker thatâ€™s far easier to fall in love with than to dispassionately admire. Its flaws are trifles compared to its versatility and emotionally stirring musicality. In a market where two-way compacts reach into the $20k+ range with relative ease, the Cremona Mâ€™s not insubstantial cost seems, well, almost reasonable. Of course at these levels much is rightfully expected. In the case of the Cremona M much is received. 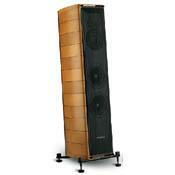 Itâ€™s one of the most rewarding loudspeakers Iâ€™ve ever had the pleasure of reviewing. It can be a pain aligning spikes with floor protectors and so two people are usually required for this, but any top speaker will have this challenge!